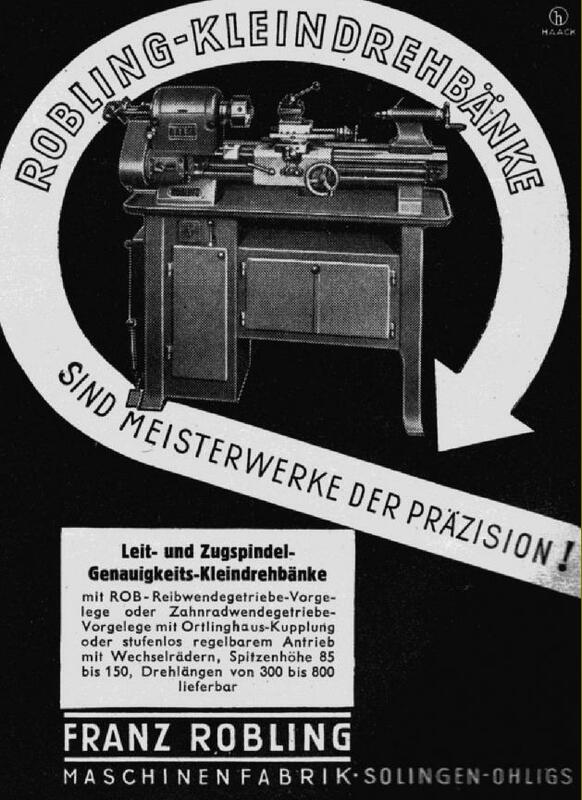 Originally makers of polishing equipment for bicycle manufacturers, the Robling lathe was made by Franz Robling Maschinenfabrik of Solingen-Ohligs, the centre of German knife and scissors production. 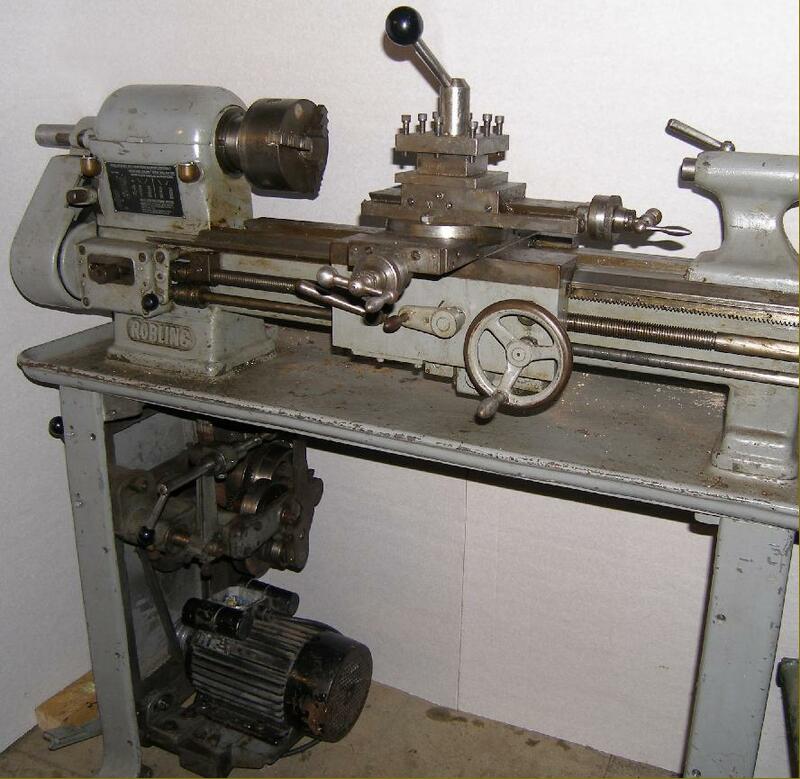 A useful machine, of 300 mm swing by 500mm to 600 mm between-centres, this was their first lathe and designed in the 1940s and manufactured until the 1960s. 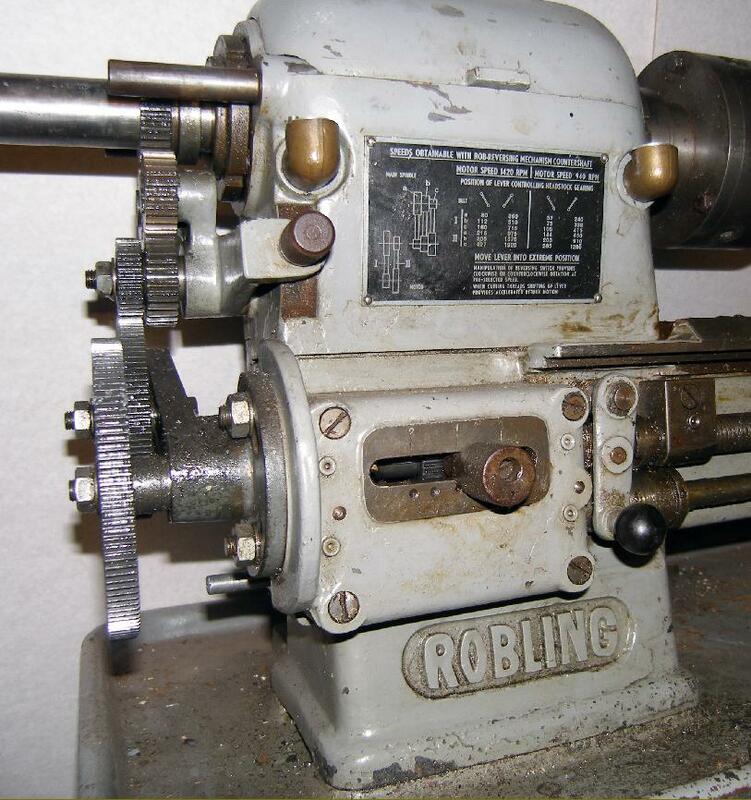 Surprisingly, for a company new to proper machine tools, Robling were to sell somewhere around 2000 examples with many still at work today in both professional precision machine shops and those of the keener model and experimental engineer. Sales in the UK were handled through William Urquhart, of 1023 to 1027 Garratt Lane, Tooting Broadway, London S.W.17. The lathe shown in detail below is an early type, the Mk. 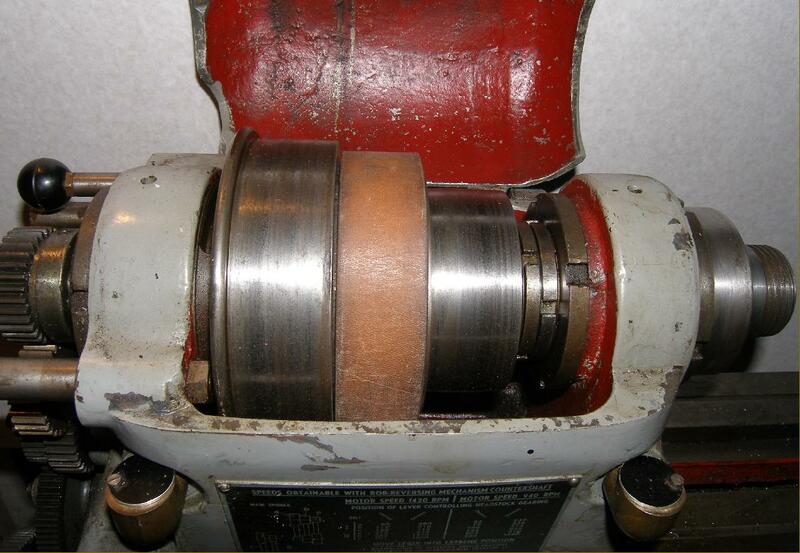 2 models had a number of significant improvements including: a 36 mm bore spindle, with a No. 5 morse taper nose, running in a roller bearing at the front and twin ball races at the rear (on earlier models, with bronze spindle bearings, the pulley ran in its own ball races to remove the effects of belt pull from the main bearings); a bed with deeper walls towards each end; a more reliable lever-operated 3-rate power-feeds and screwcutting gearbox; a heavier stand - cast-iron, as before but with a much larger enclosed plinth under the headstock; a more robust tailstock with barrel compression clamp; a much better apron with revised power-feed controls and a micrometer dial on the carriage handwheel. There was also a complete redesign of the cross-slide assembly with a greatly enlarged micrometer dial and the feed-screw support moved from a bracket bolted to the end face of the slide to a mounting on the front face of the apron - the feed-screw nut being repositioned on the underside of the cross slide. Hidden improvements included instant spindle reverse by means an Oertlinghaus gearbox with steel multi-plate forward/reverse clutches running in an oil bath - the drive working with commendable smoothness. The box was set so that reverse gear was a 1:6 ratio down from forward (or, if the motor was reversed, the other way round of course) - an arrangement particularly handy for screwcutting where the slow speed was used for generating the thread and fast reverse for returning to the start of the job. 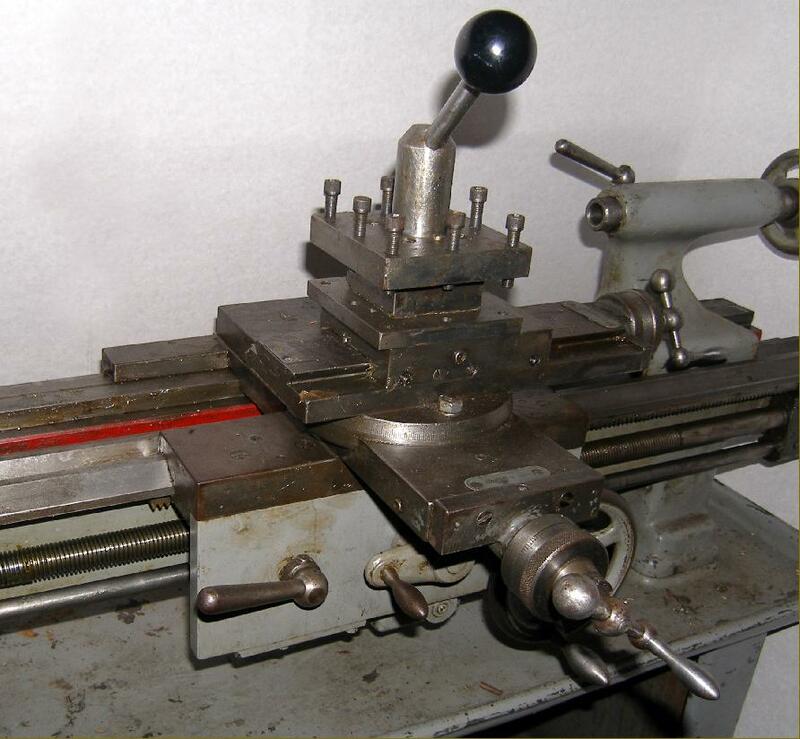 The lathe spindle could be made to revolve in the opposite direction without having to stop it first - simply moving the gearbox selector lever straight across into reverse did the job - a similar system also being employed on some Colchester lathes from the 1960s until the 1990s using either Oertlinghaus or Matrix clutches. In addition, a very useful spindle braking effect could be created by momentarily moving the gear selector lever through its neutral position into reverse. Although the 24 spindle speeds ran from a useful 55 to 1820 r.p.m. the method of obtaining the slowest 6 was unusual: the belt was moved to the low-range position, the electric motor reversed and - to make the spindle rotate forwards - reverse gear selected on the Oertlinghaus gearbox. Today, fitting a VFD (inverter drive) gets around this somewhat awkward arrangement - but does nothing to alleviate the fact that the final drive at low speeds is by a flat belt and not gears. Whilst flat belts are ideal for smooth driving at medium to high revolutions, at low speeds their ability to transmit large amounts of torque is limited. Further developments were to follow in what might be termed Mk. 3 and Mk. 3A versions with the option of a twin-dial screwcutting gearbox that generated 17 pitches and 17 sliding and surfacing feeds together with an improved drive system with infinitely-variable speeds. 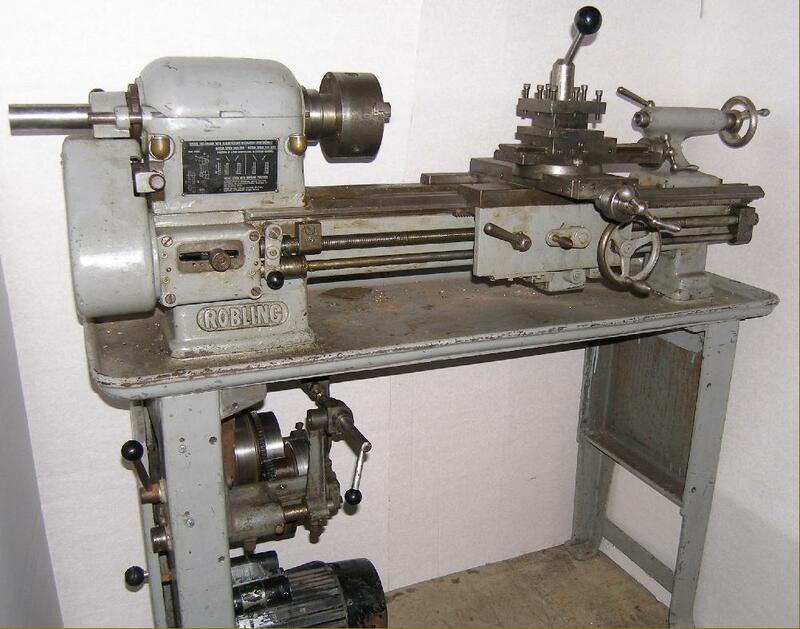 This lathe could also be had in simpler forms, with either the earlier screwcutting gearbox or with drive to the leadscrew only - meaning the lathe then lacked power cross feed. Although last versions made were clearly well-developed and of substantial construction, the first appear to have been inspired by precision plain-turning lathe practice and were possibly drawn from the company's smaller bench-mounted screwcutting model, the MB300L. 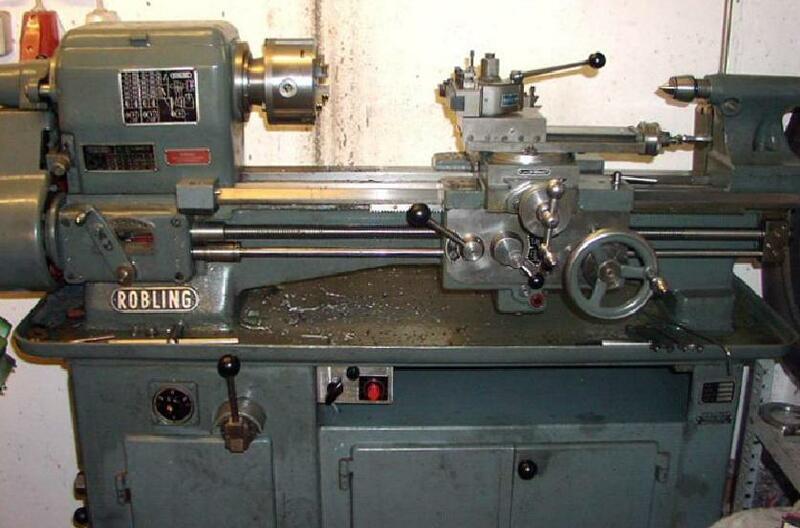 Robling Precision lathe Mk. 1 with bronze spindle bearings and complex countershaft unit. This example has lost the stand's front facia plate and storage cupboards. Features of early models included a conventional V and flat-way bed - though unusual in that both V-ways were at the front and the flats at the rear - and a drive through twenty-four speeds by a novel (and probably unique) under-slung countershaft that was described on the headstock speed plate as the "Rob-reversing Mechanism Countershaft". As a study of the phtographs above and below show, the unit consisted of four elements: a v-belt, friction wheels, a pair of gear and a final flat-drive to the spindle. The motor carried a 2-step V-belt pulley and, together with the two speeds of the motor, gave four initial speeds. The drive unit had two full-length shafts: a lower drive and upper driven. On the left-hand end of the drive shaft was a 2-step V-pulley (corresponding to that on the motor) whilst on the other (right-hand) end were two friction wheels, the inner about four inches and the outer the about two inches in diameter - the latter being only marginally greater than the diameter of the shaft itself. The drive shaft could be moved backwards and forward by a small amount, using a lever pivoting on the front of the stand directly beneath the headstock. In the high-speed position, the larger friction wheel drove the flat wheel on the countershaft, to the right of a larger gear wheel, with the smaller gear remaining engaged and idling on its stud in the high-speed position. By shifting the speed-lever at the front, the drive shaft was brought forward and no longer drove the large flat wheel on the countershaft. Instead, the small outer friction wheel made contact with the flat wheel connected to the small gear wheel (you can just see the point of contact in the picture, with a good view of the small gear and its flat wheel in the other illustrations below). Connected thus, the main spindle was now running at a much-reduced speed but, as the small gear was an extra in the train, the spindle ran backwards - corrected of course by the operator reversing the electric motor. As the Robling had no thread dial opening the leadscrew clasp nuts was a problem - but solved by leaving them closed and winding the whole job back to the start using the Rob-reversing mechanism. The effect was, that at the end of a cut the operator withdrew the tool, stopped the motor, shifted the speed lever to "fast" and switched on. The action of moving the lever disengaged the small gear from the train and the spindle ran backwards - at a conveniently high speed. At the starting point of the cut the motor was stopped, the tool advanced, the lever set to "slow" - and the job restated. The drive system was contained within a cast-iron structure that could be raised or lowered as required to adjust the tension of the final-drive belt. Today the main headstock spindle looks inadequate but, at the time, would have been considered a rugged assembly. It ran in large plain bronze bearings held in tapered housing, adjustable by screwed rings and lubricated by capillary action through rectangular felt blocks from oil sumps beneath the bearings. Some models have been found with oil-level sight glasses, probably those intended for continuous work in a factory. One thing missing from many lathes, but present on the Robling, was a means of locking the spindle in order to change spindle-nose fittings: this consisted of two holes in the rear flange of the pulley, spaced 180° apart, into which could be passed a 12 mm steel plunger that passed through a hole bored through the end face of the headstock. Cross slide and top slide, with their relatively long travel, look to have begun life on a plain-turning precision lathe and were positioned on the centre line of the saddle. The latter, with its long wings, was able to run on past the headstock and so allow the cutting to tool to reach right up to the spindle nose. Both cross and top-slide screws were 2 mm pitch with, on export versions of the early models, a rather pointless label engraved with graduated to 0.000787 " - even a very experienced British engineer, brought up on imperial measurements and completely familiar with them, would have found it difficult to visualise such a figure. On the other hand, if the dial had been left with metric graduations, where the small divisions represented 0.02 mm and the larger ones 0.1 mm (engraved 0, 05, 15, etc.) a single division of 0.02 mm would have been easy to comprehend - it being just a gnat's whisker under a "thou". However, at least Robling were being honest, for some German lathes exported to "inch" countries are known to have retained metric feed screws and nuts, but fitted with dials engraved with imperial marking. One point of interest concerning the cross and top slide screws was the smoothness with which they turned: it might be expected that the unit contained a ball-thrust bearing. It didn't - the effect was produced only by the precise fit and superb surface finishes of the components. A further interesting detail included a "two-part" slide-feed bronze nut where one half of the thread was cut into a cylinder that could be adjusted backwards and forwards within the main nut to eliminate backlash. If only all small lathes were so equipped. The surfacing feed (there was no power cross feed) was driven by a separate power shaft to an apron with a single wall that, whilst not as heavily constructed as some lathe of similar capacity with an oil-bath, double-wall assembly, nevertheless contrived to be well engineered and absolutely functional.. Drive from headstock to leadscrew was through a set of changewheels and a tumble reverse mechanism carrying bronze gears. A form of simple screwcutting and power-feed gearbox was provided to give, by a lever sliding horizontally into indented positions (with a neutral between each) three ratios for every setting of the changewheels. 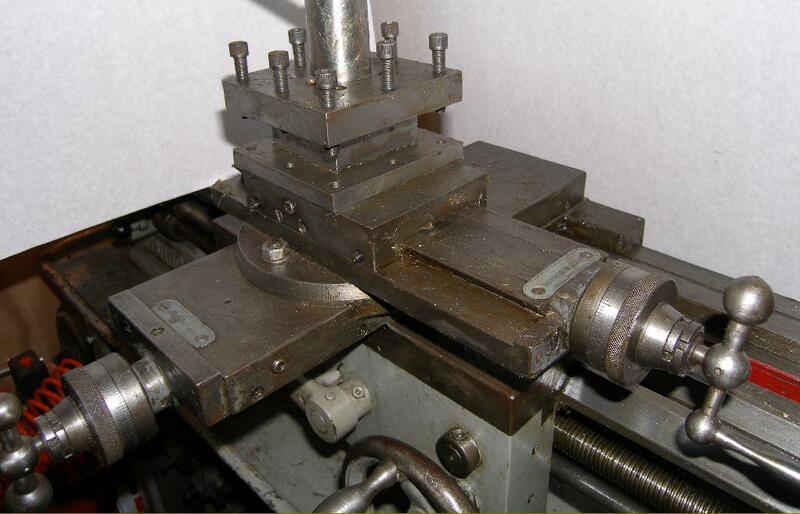 However, although the lever altered the rate of rotation of the power shaft, it did not have any effect upon the leadscrew - hence, when a change of thread pitch was needed the changewheels had to be dismounted and reassembled in the usual way. However, one useful feature was a dog clutch on the leadscrew, allowing the operator absolute control over the disengagement point. 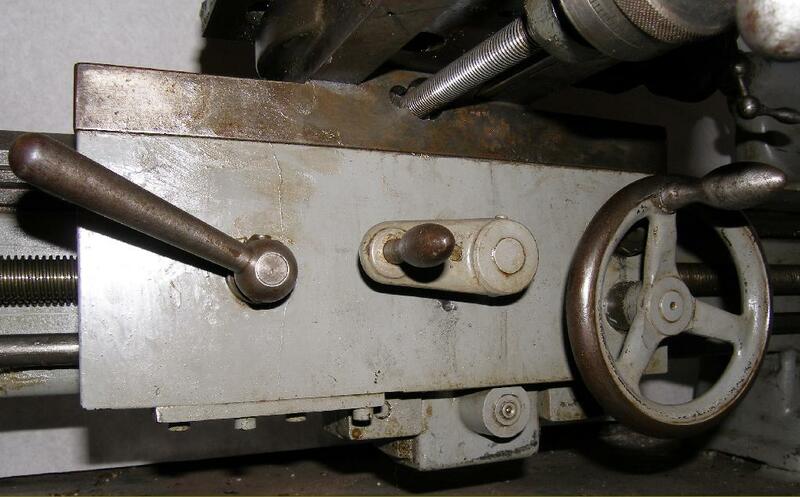 Because of the unusual gearbox arrangement it was possible to either select a neutral position on the horizontal lever and engage the screwcutting, or to leave the feed engaged - in which case both shafts would rotate. If the operator did this there was, fortunately, a mechanism within the apron that prevented both feeds from being engaged simultaneously. To provide a safety-overload the connection between gearbox and feed-shaft was by friction only through an ingenious and adjustable spring-loaded mechanism. 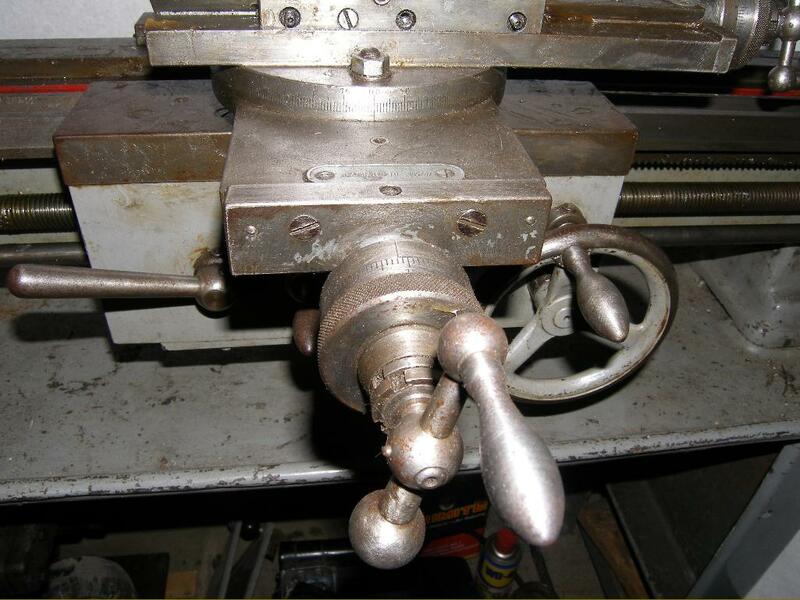 It was also possible, if you trusted the set-up, to slacken the spring and use the device as an automatic "slip-stop" when machining up to a shoulder. The unit consisted of a cup (fitted to the output shaft from the box) with a flat bottom, parallel sides and an internal thread at the opening. On the end of the feed-shaft was a two-diameter boss with the larger, at the very end, fitting precisely into the cup and able to rotate freely within it. On the smaller diameter was a notched washer able to rotate on the boss, together with a spring to provide the necessary loading. A ring nut, with plenty of play on the inner part of the boss, screwed into the cup's internal thread and pushed the components together. Passing through the wall of the cup was a round pin (visible in the photograph near the thread in the cup) that engaged with the notch in the washer and so transferred the cup's rotation to the feed-shaft. When the drive became overloaded, the washer would slide on the boss and the drive stop. To change the point at which the drive released it was only necessary to turn the ring nut - and so alter the tension on the spring. A set of twenty-four changewheels in 1.5 MOD (Metric) pitch were provided consisting of: 30t, 35t, 40t, 45t, 50t, 55t, 58t, 60t, 60t, 65t, 70t, 75t, 80t, 85t, 90t, 91t, 95t, 100t, 105t, 110,t 115t, 120t and a metric translation 127t. 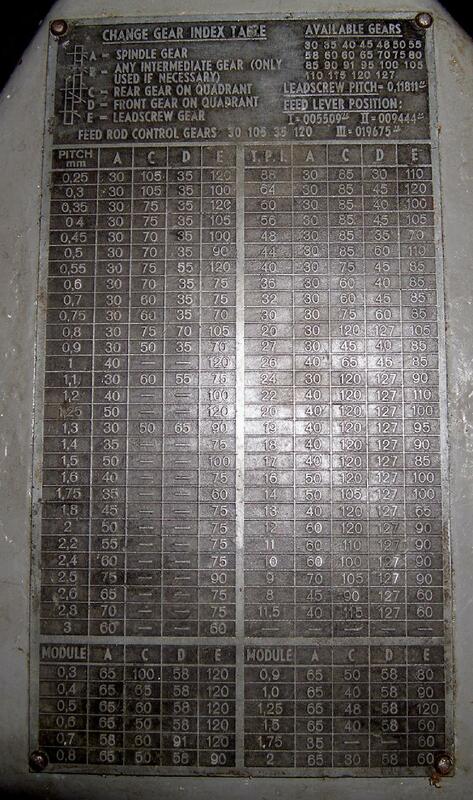 The Robling was built as an all-metric machine but, amusingly, the leadscrew pitch was given on the screwcutting chart as 0.11811 inches - or 3 mm in reality - so the whole changewheel set was actually a conversion to Imperial from metric and both pitch forms were listed in full..
A Robling Mk. 2 showing a number of significant improvements including: a bed with deeper walls towards each end, an improved 3-speed power-feed gearbox, a heavier stand (cast-iron, as before) with a much large enclosed plinth under the headstock, a more robust tailstock with barrel compression clamp, a 36 mm bore headstock spindle running in roller races with a No. 5 morse taper nose, a substantial apron with revised power-feed controls and a micrometer dial on the carriage handwheel. There was a complete redesign of the cross-slide assembly with the feed screw moved from a bracket on its end to a mounting on the front face of the apron (the feed screw nut was let into the underside of the cross slide) and greatly enlarged micrometer dials. Hidden improvements included instant spindle reverse by means an Oertlinghaus gearbox with steel multi-plate forward/reverse clutches running in an oil bath - the drive working with commendable smoothness. The box was set so that reverse gear was at a 1:3 ratio down from the forward gear (or, if the motor was reverse, the other way round) - an arrangement particularly handy for screw cutting where the slow speed was used for cutting the thread and fast reverse for returning to the start of the job. The main drawback of this model was the absence of either a speed-reducing backgear or even a layshaft. 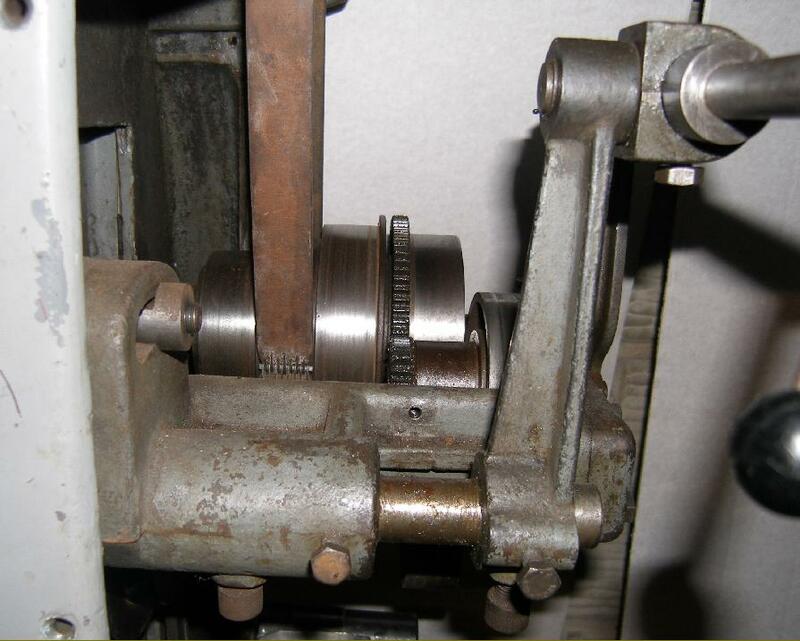 Although a 2-step pulley on motor shaft and gearbox input shafts gave a range of slower speeds, the torque able to be transmitted by the final flat belt drive was limited. 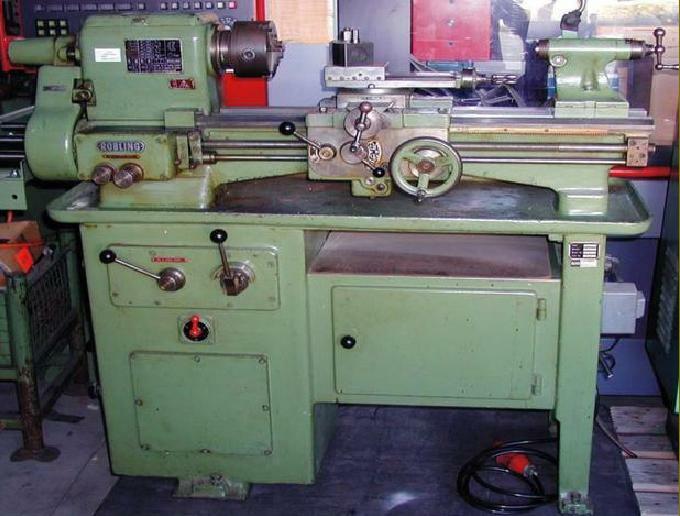 Further details about this lathe can be found here. Probably the final production form - the Type 650E and 850 - both named after the between-centres capacity. This model shows some further improvements including an optional twin-dial screwcutting gearbox (which generated 17 pitches and 17 sliding and surfacing feeds) and a stand holding an improved drive system (again with an Oertlinghaus multi-plate clutch). 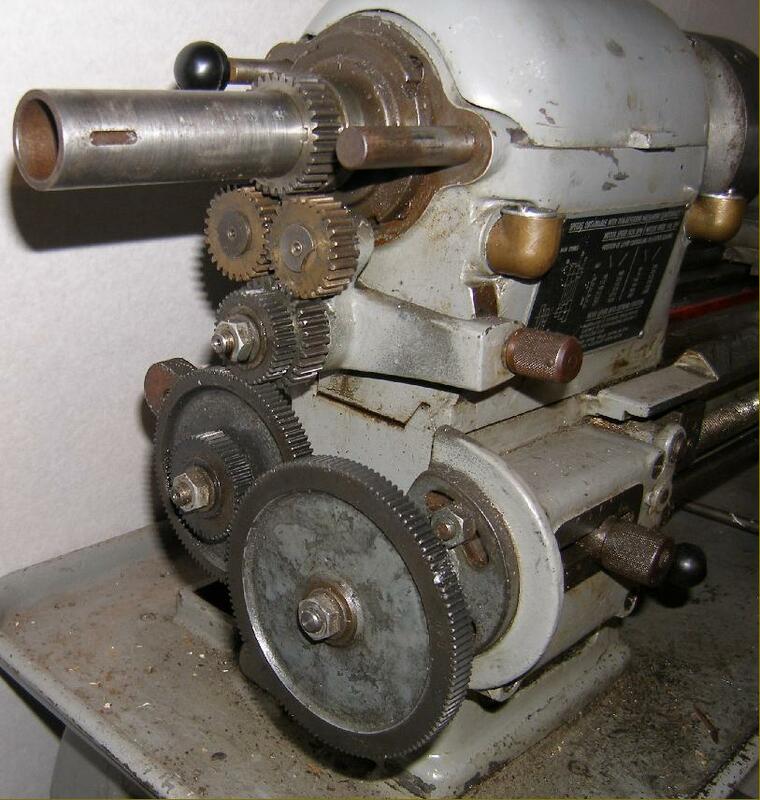 The screwcutting and feeds gearbox was optional, and could be replaced by a plain cover with drive to a leadscrew only - meaning the lathe then lacked power cross feed. Yet another variation on the Robling Model 600 and 800 theme, the "Mk. 3". 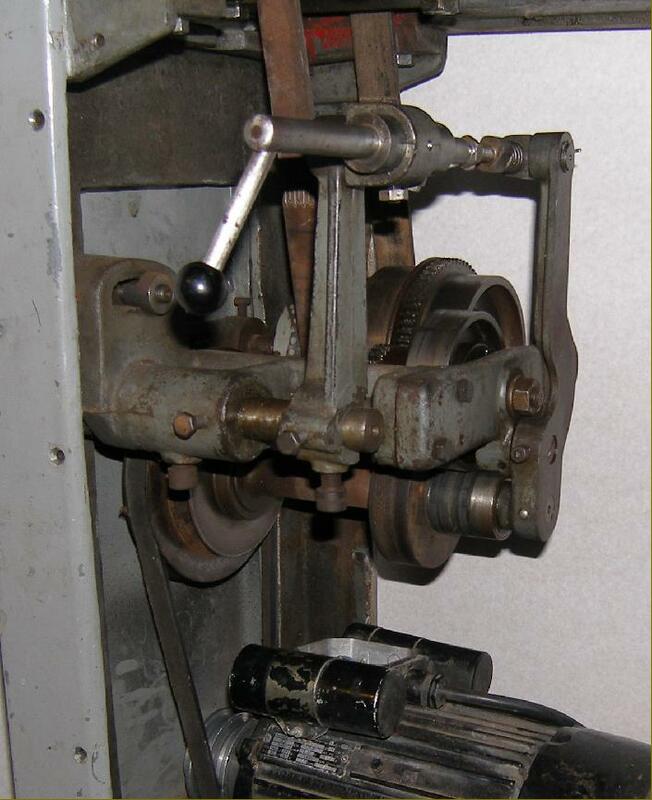 This model had an external, flange-mounted motor powering a variable speed drive system - hence the need for the headstock-mounted revolution counter. 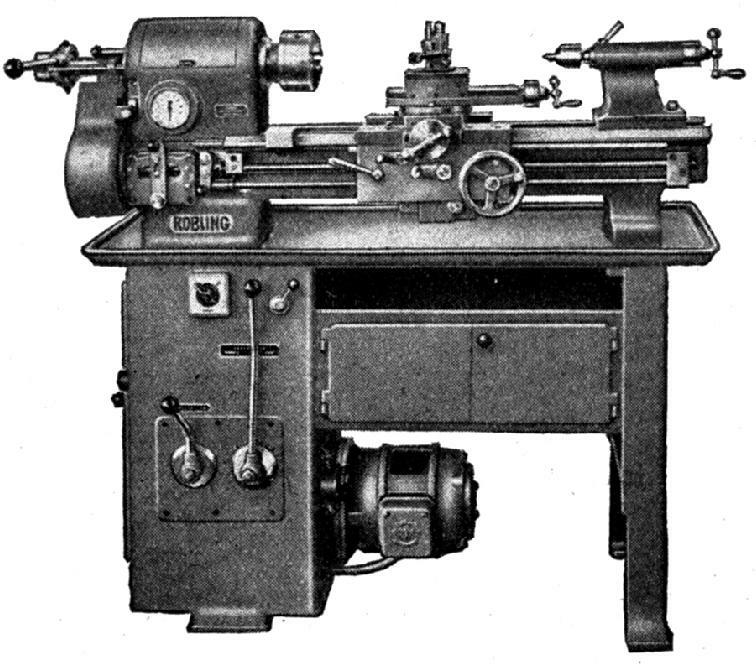 A later version of this lathe was produced with a fully-enclosed drive system. Backgeared, screwcutting, with tumble reverse and a built-on countershaft unit the Robling MB300L had an 85 mm centre height and could accept 300 m between centres. Note the overhung leadscrew.